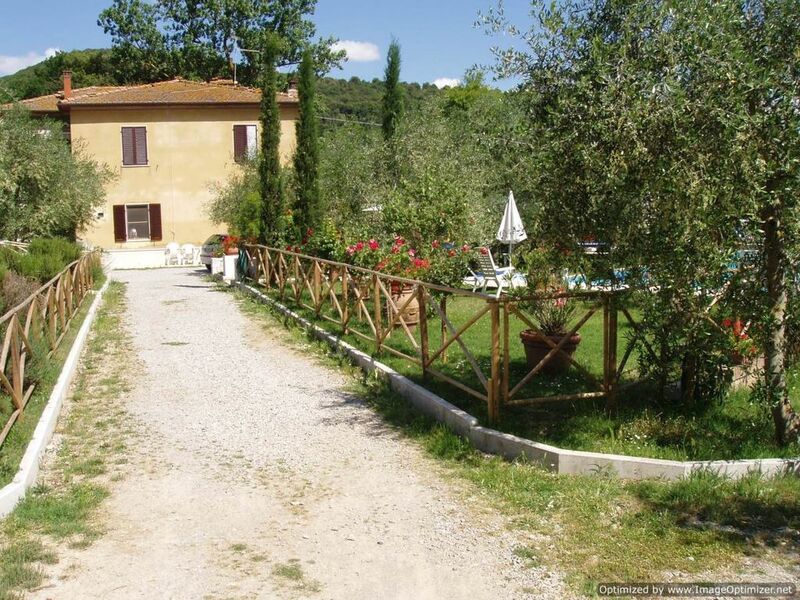 Located outside the village of Asciano, in the heart of the Le Crete Senesi, lies this lovely house named La Pincina. The house is divided into two sections. The ground floor apartment is occupied by the friendly owners; the first floor apartment is for rent. Simply furnished in traditional Tuscan style, the apartment offers comfortable accommodation for four people. The apartment of 90 square meters consists of a living room; a separate kitchen (oven, stove, fridge/freeze); one double bedroom; one twin bedroom and a bathroom with shower. In the spacious and lovely garden, there is a beautiful swimming pool (12 x 6 meters  deep max 2. 35 meters) shared with the owners. The apartment has its own private outside area furnished with table and chairs for dining out. Barbecue facilities are at the guests disposal. Asciano is 4 km away where you can find shops, supermarket, restaurants, banks etc. Serre di Rapolano, famous for the travertine marble, is the nearest village; Siena is 26 km away.